Over-the-counter (OTC) pain relievers can help relieve pain or lower a fever. Over-the-counter means you can buy these medicines without a prescription. 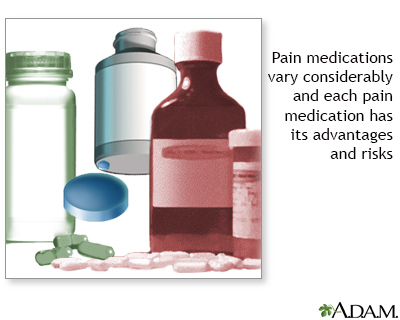 The most common types of OTC pain medicines are acetaminophen and nonsteroidal anti-inflammatory drugs (NSAIDs). Taking pain medicines before exercising is OK. But do not overdo the exercise just because you have taken the medicine. Read labels to learn how much medicine you can give your child at one time and during the whole day. This is known as the dosage. Talk to your pharmacist or your child’s health care provider if you are not sure about the correct amount. Do not give children medicine that is meant for adults. If you take pain relievers on most days, tell your provider. You may need to be watched for side effects. Do not take more than the amount recommended on the container or more than your provider tells you to take. Read the warnings on the label before taking the medicine. Store medicine safely and securely. Check the dates on medicine containers to see when you should throw them away. Acetaminophen (Tylenol) is known as a non-aspirin pain reliever. It is NOT an NSAID, which is described below. Acetaminophen relieves fever and headaches, and other common aches and pains. It does not relieve inflammation. This medicine does not cause as many stomach problems as other pain medicines do. It is also safer for children. Acetaminophen is often recommended for arthritis pain because it has fewer side effects than other pain medicines. Examples of OTC brands of acetaminophen are Tylenol, Paracetamol, and Panadol. Acetaminophen prescribed by a doctor is usually a stronger medicine. It is often combined with a narcotic ingredient. Adults should not take more than 3 grams (3,000 mg) of acetaminophen in a single day. Large amounts can harm your liver. Remember that 3 grams is about the same as 6 extra-strength pills or 9 regular pills. If you are also taking pain medicine prescribed by your provider, talk to your provider or pharmacist before taking any OTC acetaminophen. For children, follow package instructions for the maximum amount your child can have in a single day. Call your child's provider if you are not sure about the instructions. NSAIDs relieve fever and pain. They also reduce swelling from arthritis or a muscle sprain or strain. When taken for a short time (no longer than 10 days), NSAIDs are safe for most people. Some NSAIDs can be bought over the counter, such as aspirin, ibuprofen (Advil, Motrin), and naproxen (Aleve, Naprosyn). DO NOT give aspirin to children. Reye syndrome can occur when aspirin is used to treat children who have viral infections, such as chickenpox or the flu. Have heart disease, high blood pressure, kidney disease, or stomach or digestive tract bleeding. Take other medicines, especially blood thinners such as warfarin (Coumadin),clopidogrel (Plavix), apixiban (Eliquis), dabigatran (Pradaxa), or rivaroxaban (Xarelto). Are taking NSAIDs prescribed by your provider, including celecoxib (Celebrex) or nabumetone (Relafen).